When Galway's senior hurlers last won back-to-back All-Irelands in 1987 and '88, they played a total of five games - one of which was against London. Sunday will be their current team's ninth match of this extraordinary hurling summer. Within that epic, they have displayed signs of occasional vulnerability for the first time in two years but also, the tenancies of great champions. The necessity of two replays, forced by uncharacteristic lulls in Galway's performances against Kilkenny and Clare, briefly made them look mortal again. That they have gone on to win both replays screams of a depth of character, the sort associated with teams that win back-to-back All-Irelands. 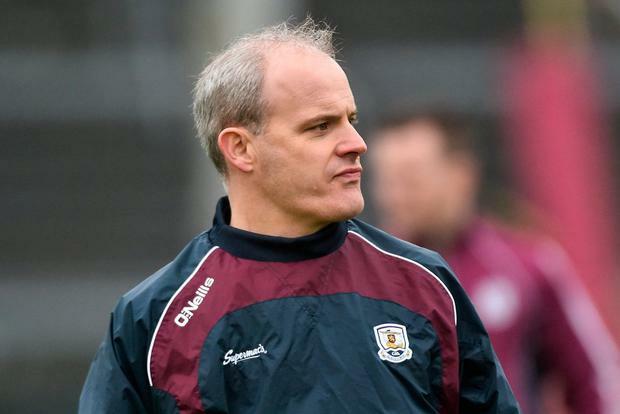 "I think we've learned a lot this year in terms of going in as winners," observes their understated manager, Micheál Donoghue, the man on whose watch Galway have morphed from an extravagantly collective of individuals into a single-minded, hardened team of winners. "And I think the expectation on us every day, people just expect us to go through it unscathed and not lose in the championship. It's not that we ever use it as a crutch or anything like that. Look, it's the same as any sport in the world, if you're up there, you're there to be knocked and that's the challenge, to try and stay there. "Look, I think we've massive experience. The lads have gone through an awful lot in their own careers, both in their clubs and at intercounty level and they've drawn on that. "It's been a different challenge for us this year but I think it's one they've adapted to pretty well." That they are being held to higher standards hasn't gone unnoticed from within. It seemed curious at the time but Joe Canning's observation that Galway "didn't get a lot of respect over the week from media and such," in the week of their replay with Clare in Thurles showed that even the greatest aren't impervious to critique. "Our character was questioned I thought," he went on. "People were saying we didn't perform." Donoghue seems less interested in the opinions of others but notes: "I think we live in a world now where there's a lot of opinion and everyone's entitled to their opinion as well. "There's so many media outlets as well, and it's his prerogative to say what he wants in relation to that and I support him and back him 100 per cent. "I think," he observes, "over the last few weeks we've obviously started well and teams have come back into it. "But they've shown great heart and leadership to stay in the games and we've got some massive scores when we've needed them. "I've said it as well over the last few weeks, you're not going to dominate a game for 70 minutes. "It's to maximise when you're on top and minimise the opposition's effect when it ebbed and flowed." Even to be back in a final after all the excess of a famine-ending All-Ireland is part testament to the ambition of the group and part tribute to Donoghue's managerial acumen. In a season when Galway have played more games in their history, he has managed to keep the squad notably in form and mostly, free of injury. "I think for us maybe with the new structure and everything starting earlier, and with the way the year finished for us and the break and so on, getting back into it probably took us a bit longer," Donoghue says. "But I think once we were open with the group and everybody really knew where we were, we put a time-scale on this is where we had to be at this particular time. "We just used the league to get through it again, and it's funny given it's two Division 1B teams in the final. "We just used the league to get back in but once we hit the championship I thought we hit the stride well. "I keep giving all the praise to the players, they are highly motivated and they want to be as successful as they can. "When they are that driven, it's easy for us." As it stands, the only match Galway have lost all year in their 1B promotion-decider with Sunday's opponents, Limerick. "I think they have had a massive year, huge momentum," Galway boss Donoghue points out. "John (Kiely) has done a massive job with them. "We got to see first-hand how impressive they were in the league and they've carried that right into the championship. "They've had some massive results. I think when you get here the two best teams always end up there. "They are going to be formidable for us. "We have the height of respect for them. "I know it's going to be a huge challenge but it's back to the old cliché with myself: it's just on ourselves and our own performance," Donoghue concludes, "that's all we can focus on now."